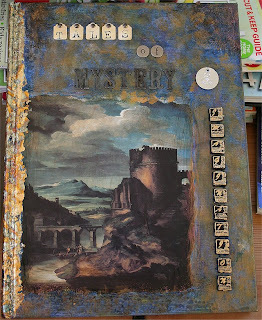 OK I may as well start with the cover of my altered book which I did a couple of weeks back. I gessoed the cover & sponged on polished pigments & paints for the background then added the picture & blended it in. Lastly I put on the title (I made the IMAGINATION letters down the right hand side from moulds) & covered the spine with gold leaf. This is my first attempt at an altered book (actually, an altered anything!). I used the title Tales of Mystery & Imagination (the name of an anthology of short stories & poems by Edgar Allan Poe) because that is exactly what I am trying to show - the idea is that the pages will show the inspiration & imagination that I use to create different things. Hi Robyn....welcome to the blogging community! I love your altered book and can't believe it's your first altered project...really great! Whoo Hoo....I just realized I'm the first ever to comment at your blog! Hi Robyn... congrats on taking the plunge into the blogosphere! Love those Polished Pigments - gorgeous cover... would love to see it irl! Wow I love this. Looking forward to more of your altered projects.